Yes, it’s finally happened. That whimsical (or annoying) little yellow sponge has officially arrived on the Kindle. Thursday Mobigloo games — the makers of Jewels and Reversi Deluxe — released “SpongeBob’s Treasure Quest,” a new game for the Kindle using characters from Nickelodeon’s popular children’s cartoon. The yellow sponge is now black and white — but he’s also wearing a pirate’s hat and an eyepatch over one eye. There’s no animation — the storyline is advanced with four-panel comic strips — but you can almost hear the characters’ goofy voices as you’re reading the dialogue. Hey Patrick, look at this old map. Wow SpongeBob, that’s not just any old map. That’s a treasure map! Wow. Whaddya say we go on a little adventure? Okay. Where do you want to go? The game’s web page at Amazon.com explains that “It’s up to you, with a little help from Patrick and Sandy, to guide SpongeBob through the deep to uncover the treasures for the Krusty Krab.” The restaurant where SpongeBob works competes with “The Chum Bucket,” and their arch-rivals try to stop him from collecting the treasure icons scattered throughout 50 grids. “It is slightly like Pixel Perfect,” explains a review on Amazon, “in that you have a grid with numbers on the side with information.” Within 48 hours, it had already become one of the top 10 best-selling Kindle games — and it currently ranks as the #239 best-selling item in the entire Kindle Store! As strange as it seems, I feel like the SpongeBob gives the Kindle some more legitimacy as a platform for game developers. It’s the first “brand-name character” to appear in a Kindle game — someone who’s already very well-known from a major mainstream cartoon. Is it possible that someday we’ll see Kindle games with Mickey Mouse, Bugs Bunny, or Shrek? Even if you’re not a fan of SpongeBob SquarePants, this still feels like a milestone. Technically SpongeBob made some earlier appearance on the Kindle — in audibooks. In 2003, Audible began releasing audiobook versions of the “chapter book” stories for young readers describing new adventures for the show’s characters. They were read by Mr. Lawrence — one of the voice actors for the show — though unfortunately, he’s not the original voice of the talking sponge, and young listeners may notice the difference. Then again, the show’s creator had originally wanted to call the character “SpongeBoy.” His network insisted he change it when they discovered that name was already taken — by the marketers of a mop accessory! 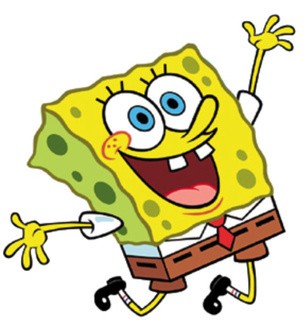 Of course under the ocean, sponges aren’t yellow and perfectly square, but the show’s creator had made the switch as a kind of private jokes for marine biologists. (Before his career as an animator he’d earned a degree in natural-resource planning at Humboldt State University, according to Wikipedia, and his emphasis was on ocean resources.) His cartoon has since become not only Nickelodeon’s highest-rated show, but also its longest running. It’s been on the air since 1999. The game developers who produced this game also created the Kindle utilities Easy Calculator and Sticky Notes (as well as Mahjong Solitaire and the new “Mahjong Solitaire Halloween Edition”). 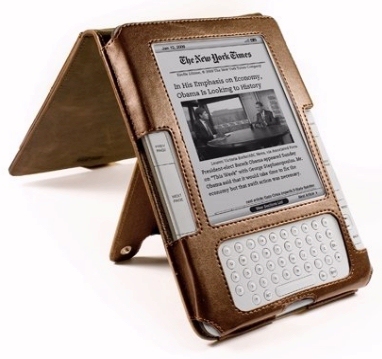 And the bottom line is that it’s yet another new way to have fun on your Kindle. My friend Len Edgerly interviewed me for his podcast this week (“The Kindle Chronicles”), and I tried to explain why I’m so excited about the variety of new games available on the Kindle. Now you’ve reached a point where you’ve got hundreds and hundreds of developers, and it’s going to get wacky, like all the apps you can find on your iPhone now, where any high school kid or college kid or crazy inventor someplace out there in the world who has a wild idea for some kind of game or some kind of app, some kind of instantaneous local celebration of the holiday — can boom! Make it available in the Kindle Store for your Kindle. More fun things we can do than we ever dreamed possible. Will Librarians Revolt Over Amazon’s Kindle Lending Program?